Courageous Christians United - Blog - Responding to LDS Apostle Jeffrey R. Holland on "Are Mormons Christians?" In my Facebook dialogue adventures, I've discovered there is a popular video that LDS think wins the day for them in their efforts to be considered Christians. 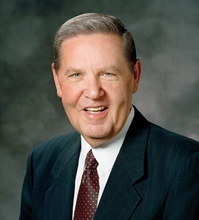 The short 10 minute video is a talk by LDS Apostle Jeffrey R. Holland called, "Are Mormons Christians" at the 177th October General Conference (2007), and it may be viewed here. "The only time God has ever had a body of flesh and bones was the 33 years that Christ walked the earth. What Holland and the LDS Church cannot comprehend is that Christ, during that period was fully a man and maintained His relationship with God the Father as a man. There are more proof texts confirming Christs oneness with the Godhead than those quoted by Holland separating Him from it (Jon 1:1-3, 14-15, Matt 16:15-17,1 Cor 16:22, Rev 1:8, 17-18, etc.,etc.). "I think Jeffrey R.Holland is more correct. I cannot conceive that Jesus would be praying to himself. Or as someone explained to me that God is like a water. He may manifest himself either a water vapor, or a liquid, or as ice. But my thinking is if their he only one water molecule, then he can only appear in one state of being at any point in time. At Jesus' baptism all three are there at the same time. And in John 17:11, 20-23, 26 Jesus prays for his apostles and says "that they may be one, as we are"; That they may be one; as thou Father, art in me, and I in thee, that they may be one in us"; "that they may be made perfect in one". "The challenge is not to decide between the arguments presented by Mr. Sivulka and Mr.Holland. The conclusion to be drawn comes from the decision whether or not Joseph Smith lied about seeing two personages (God, the Father and Jesus Christ, His Son) in a grove of trees. If he lied then Mormonism is a lie and we still have to answer the question for ourselves. If he didn't lie then we have an eye-witness to an account that settles the matter. ""So how do we determine if Joseph Smith was a liar? Maybe we could ask God?" Respectfully, that's a fallacious argument. It's like suggesting that the jurers on a jury go pray about whether Bernie Madoff committed fraud rather than looking at the evidence. Of if you would prefer a religious figure, it's like asking God if Warren Jeffs really committed the crimes that he's accused of rather than looking at the body of evidence. And in this case the body of evidence that Mr. Sivulka has consistently cited above as supporting evidence is the Bible. After all, that's what Christians do isn't it? For Christians the Bible is the ultimate and absolute authority on theological matters isn't it? Again, our ultimate authority for this passage isn't prayer, feelings, or spiritual impressions, it's what God has objectively revealed in and spoken to us the Bible, isn't it? "For me, I believe that Muhammad was a prophet because of the Qur'an--because I read it, and in my own estimation after reading it, reflecting on it, and praying about it, I found in myself an unwavering belief that the Qur'an is without a doubt revealed by the Lord of the Worlds, by the Almighty God." "I bear witness that there is no god but Allah, and I bear witness that Mohammed is the servant and Messenger of Allah."